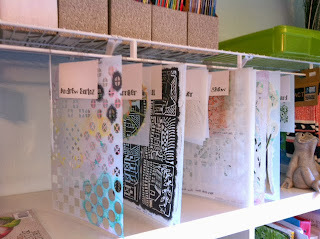 LINDA KITTMER'S FIBRE ART, PHOTOGRAPHY & JOURNALLING: Brilliant Idea for Stencil Storage! 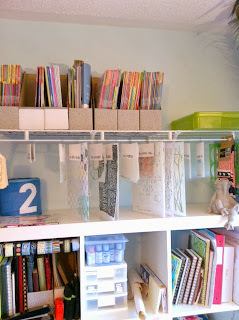 Brilliant Idea for Stencil Storage! 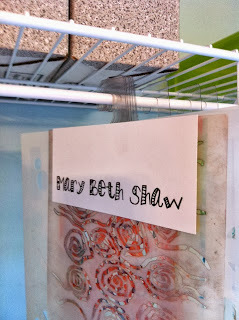 Thanks to a post on StencilGirl Talk, by Carolyn Dube, sharing how she and Maria McGuire store their stencils, I've been able to adapt their idea to fit my studio space and now I've got a great way to store my stencils, while keeping them visible and easily accessible! My method also gives me some shelf space to store my magazines! Only $20 for four feet of closet shelving complete with the hardware needed to hang it, an easy installation (make sure you're screwing into studs if you plan to have any weight on the shelf! ), plus the J hooks and its ready to use! Thanks so much Carolyn and Maria! 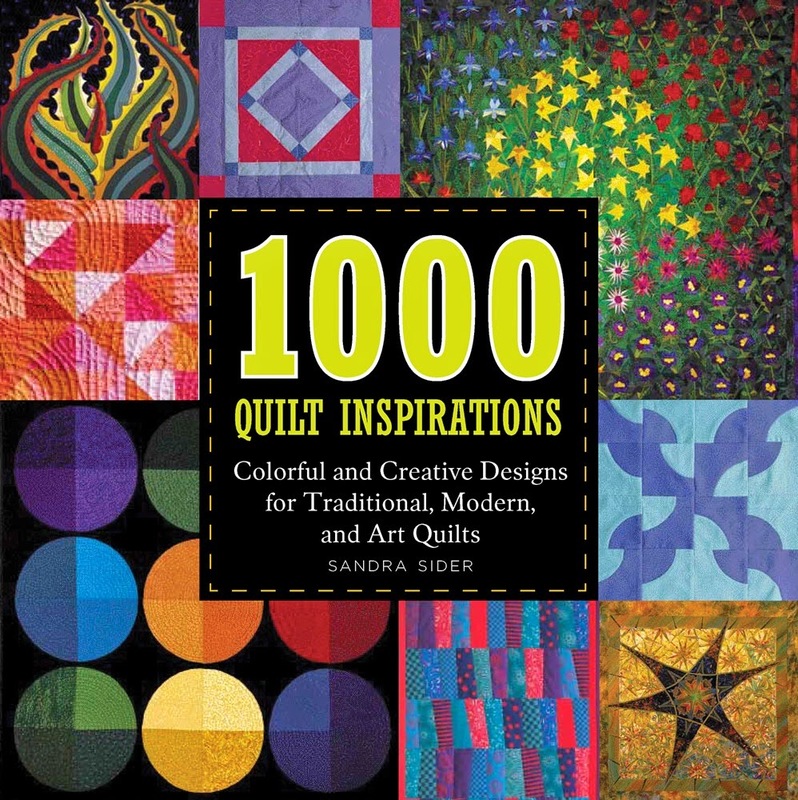 I never would have thought of this fabulous idea without your inspiration! It's the perfect solution since I don't have room for those amazing racks that you use! LOL I won't tell a sole. That is such a great idea! I have room to do this~so thanks so much Linda. Fantastic Ruth! Glad to be able to share the idea. Great idea!! Mine are in binders and drawers where I can't see them. This is so much better. Yes, if you're like me, if you can't see them you don't likely use them (or not as much as you would if they were visible and tempting you). That's a fabulous solution, Linda! Thanks Marjie. It's working fabulously! I love to hear what you think . Thanks for your comment . I've had to add moderation because of a lot of spam, but your message will be posted soon. Thank you! 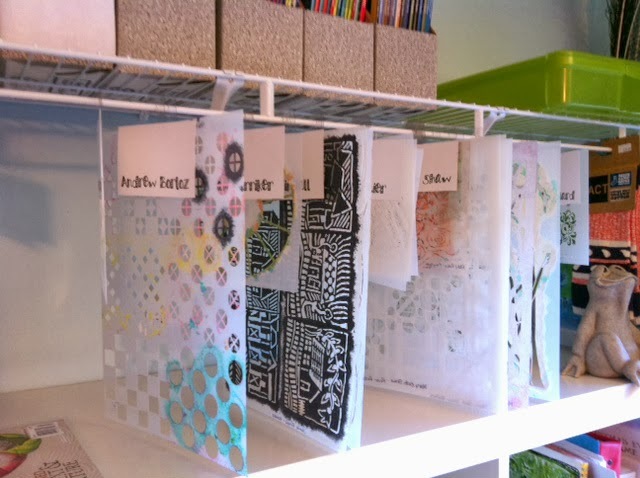 I am a fibre and mixed media artist who works primarily with my own hand-dyed fabrics, fibres and threads. 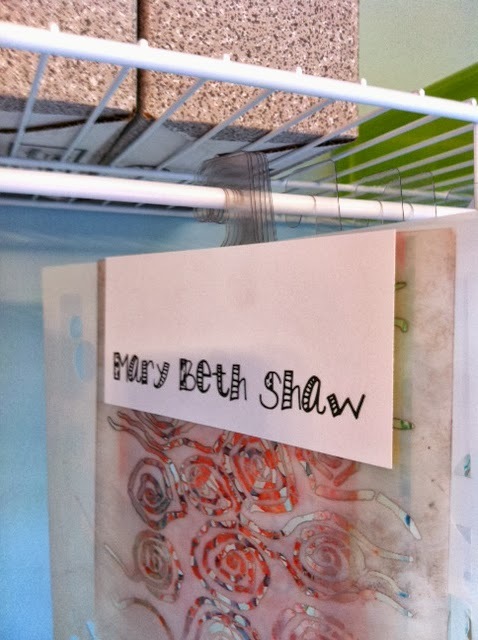 I enjoy creating unique pieces using various surface design techniques. In the spring of 2006 my friend Heather and I started the 'Group of Eight Fibre Artists’ or GOE (rhymes with toe) as we refer to ourselves. We meet monthly, inspiring and challenging one another in our art. I also enjoy photography and art journalling and I try to make time for art daily. I say try, because all of this art is fit into my volunteer role as a foster 'Mom' to Future Dog Guides which I raise for the Lions Foundation of Canada Dog Guides. I raise these incredible puppies from 6 1/2 weeks until they are about 10 to 12 months old, teaching them all of their basic commands and socializing them, getting them ready for life as a working guide dog for one of six roles: Canine Vision, Hearing Ear, Autism Assistance, Seizure Response, Diabetic Alert or Service Dog for the Physically or Medically Disabled. Thanks for joining my blog site. I'm honoured! Have You Ever Seen One Of These Up Close? 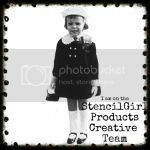 I'm proud to be on the StencilGirl Creative Team!